What’s Really Different About CAT6 and CAT6A? The background of data communications is almost directly connected with earlier expansions of cabling and connecting hardware. The exceptional performance of LANs (local area networks) and other high-performance data networks requires the use of the proper cables and connectors. LAN technologies have advanced over time, making Ethernet connectivity the revered technological choice for LANs. For example, it can be hard to believe that high-speed networks, such as Gigabit and 10 Gigabit Ethernet, all started from general telephone networks. As technology and high-speed networks have evolved and been more in demand, cables and their components have been expected to advance. Now, cables and their components have been tailor-made to transmit at higher speeds over longer distances. For example, copper classes and categories have been introduced so network guidelines/restrictions would be clearly set and the proper connectors would be installed for each project. For instance, CAT3 was implemented towards the end of the 80s, which could support voice applications and 10BASE-T Ethernet. However, CAT5 technology had been introduced by the mid 90’s because CAT3 could no longer provide the faster speeds that networks required. CAT5 could support up to 100Mbps in speed. 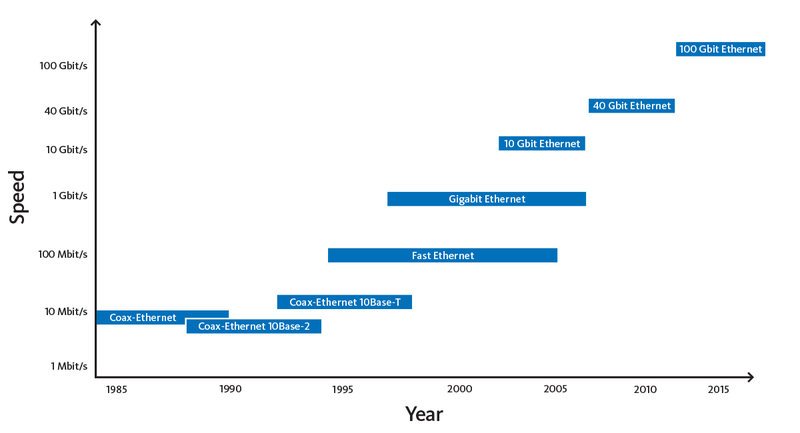 A further advancement of cables and connectors was introduced when CAT5e surfaced; CAT5e was even more efficient at supporting Gigabit network applications. CAT5e is the upgraded version of CAT5 because it has stricter cross talk conditions, which made Gigabit network applications and high data transfer scenarios more dependable. There are multiple perks of using CAT6 cabling over CAT5e cabling systems. In the early years of CAT6, it was a luxury to use because it was nearly 50% more expensive, making it less cost efficient. But, as time has progressed, the cost of CAT6 has flattened tremendously. Some advantages CAT6 has over CAT5e are as follows: higher bandwidth and higher data transfer rates. As a result, CAT6 is now the staple when it comes to new cabling applications. CAT6 can support 1 Gbps network speeds effortlessly. In addition, CAT6 supports the higher data rates of 10 Gbps, but only over distances spanning between 37 and 55 meters. CAT6A is able to support data transfer rates around/near/close to 10Gbps with a ultimate bandwidth of 500MHz. Compared to CAT6, CAT6A has more and tighter twists, with more insulation to minimize crosstalk. In addition, CAT6A is backwards compatible with CAT5e and CAT6 technology. Although the latter is true, speeds are always directly correlated and will perform based on the lowest rated cable or connecter installed in the arrangement. CAT6A is quickly becoming the most cost efficient option/choice because it is proven to be a reliable system. CAT6A elements are utilized in Class EA networks systems and are characterized in ISO/IEC 11801 and TIA/EIA 568. One of the disadvantages of CAT6A is that the cable does not have a smaller diameter and lighter weight compared to CAT6. When CAT6A first surfaced 2008, it was 50% bigger. Additional room was required for the cable to bend behind patch panels and wall outlets. Since 2008, it has been trimmed in size by about 10%. Another misconception of CAT6A was that the termination methods and timeframes were too long. But, as new modular jacks and outlets have come about, they can be terminated in about 2-3 minutes. This had minimized overall installation cost and time. On the contrary, the primary reason why people vouch for CAT6A networking is because it is future proof. CAT6A is a great investment for cabling networks that are expected to last 5+ years, even 10+ years, if maintained well. CAT6A – Did I Consider Everything? Another available option for end users is the choice of shielded or unshielded solutions. Shielded and unshielded are both beneficial for their own reasons. For example, shielded CAT6A cables usually has an outer shield of foil around each copper pair, whether individual or around all four 4-pairs. Furthermore, modular jacks, outlets, and patch panels are protected from electromagnetic interference using a metal housing around all their components. Each application has its unique use and benefits. CAT6A cables come in multiple arrangements. Shielded cables are usually labeled as F/UTP and unshielded cable as U/UTP. The first letter specifies the overall shield type while the other letters specify the shielding type and element balance for each pair. CAT6A U/UTP signifies that the cable has 4 unshielded twisted pairs and no exterior shield. CAT6A F/UTP signifies that the cable also has 4 unshielded twisted pairs, but, it is completed with an exterior foil shield. This indicates that CAT6A F/UTP is a shielded cable. Moreover, S/FTP cable classification, or screen/foil twisted pair, is usually a CAT7 cable that has 4 singularly shielded pairs and exterior screen braid around each pair. One of the most recent additions to the CAT6A cable collection is the U/FTP cable. This cable shields each of the 4 pairs individually instead of placing an outer shield over all 4 pairs together. This cable has overall performed well and left a notable impression. Upgrade from CAT6A unshielded – there is more headroom spanning the multiple testing parameters. Supplementary testing is a necessity for CAT6A applications. But, network testing uses a “Pass/Fail” system that quickly and efficiently tests network performance. Alien cross talk starts at 350Mhz for CAT6A, which is why it requires more testing than CAT5e and CAT6 applications. The answer to this question really depends on the needs of each specific business. For example, what applications are being used presently? What applications will the company consider using in the future? What type of network growth or expansion, regarding transmitted data and user number, does the company expect over the next five years? How many years is the building expected to last? What is the future of cabling standards and requirements? What is the quota expected to be? What will the cost of network upgrades for bandwidth be? In conclusion, there are multiple things to consider when determining the right network to install. But, CAT6A is becoming one of the best decisions because it is able to fit present needs while being able to adapt to future speed needs. CAT6A comes in shielded and unshielded applications, with each option being significant for different uses. In addition, CAT6A is backwards compatible with CAT5e and CAT6 because of the usage of the RJ45 connector. CAT6A is also affordable for present and future applications because it supports higher speeds and 10Gbps network speeds up to 100 meters. Furthermore, CAT6A and structured cabling products can be used for multiple applications outside of the standard voice and data. Such applications are Building Automation, CCTV, Access Control, etc. Therefore, this capability provides the advantage of combining all these application types into one strong structured cabling system.